Covering the world of big data and data governance. Matching algorithms, the functions that allow data quality tools to determine duplicate records and create households, are always a hot topic in the data quality community. In a previous installment of the Data Governance and Data Quality Insider, I wrote about the folly of probabilistic matching and its inability to precisely tune match results. To recap, decisions for matching records together with probabilistic matchers are based on three things: 1) statistical analysis of the data; 2) a complicated mathematical formula, and; 3) and a “loose” or “tight” control setting. Statistical analysis is important because under probabilistic matching, data that is more unique in your data set has more weight in determining a pass/fail on the match. In other words, if you have a lot of ‘Smith’s in your database, Smith becomes a less important matching criterion for that record. If the record has a unique last name like ‘Afinogenova’ that’ll carry more weight in determining the match. The trouble comes when you don’t like the way records are being matched. Your main course of action is to turn the dial on the loose/tight control to see if you can get the records to match without affecting record matching elsewhere in the process. Little provision is made for precise control of what records match and what records don’t. Always, there is some degree of inaccuracy in the match. In other forms of matching, like deterministic matching and rules-based matching, you can very precisely control which records come together and which ones don’t. If something isn’t matching properly, you can make a rule for it. The rules are easy to understand. It’s also very easy to perform forensics on the matching and figure out why two records matched, and that comes in handy should you ever have to explain to anyone exactly why you deduped any given record. But there is another major folly of probabilistic matching – namely performance. Remember, probabilistic matching relies heavily on statistical analysis of your data. It wants to know how many instances of “John” and “Main Street” are in your data before it can determine if there’s a match. Consider for a moment a real time implementation, where records are entering the matching system, say once per second. The solution is trying to determine if the new record is almost like a record you already have in your database. For every record entering the system, shouldn’t the solution re-run statistics on the entire data set for the most accurate results? After all, the last new record you accepted into your database is going to change the stats, right? With medium-sized data sets, that’s going to take some time and some significant hardware to accomplish. With large sets of data, forget it. Many vendors who tout their probabilistic matching secretly have work-arounds for real time matching performance issues. They recommend that you don’t update the statistics for every single new record. Depending on the real-time volumes, you might update statistics nightly or say every 100 records. But it’s safe to say that real time performance is something you’re going to have to deal with if you go with a probabilistic data quality solution. 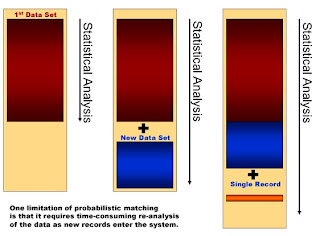 Better yet, you can stay away from probabilistic matching and take a much less complicated and much more accurate approach – using time-tested pre-built business rules supplemented with your own unique business rules to precisely determine matches. I don't think the real time performance problems are that bad. You don't need to update your matching statistics in real time or near real time because they are unlikely to be changed much by a daily load of new names. If you've got 20 million names and you add 1000 more during the day it's pointless to update the probabilistic statistics. If you are running the matching and statistics on a massively parallel architecture like the IBM Information Server you can design for performance in batch or real time modes for very high volumes. You wouldn't base survivorship or matching on the probabilistic match alone - a good match job design would also use rules that compare other fields on the customer record to validate the name match. A combination of probabilistic and rules matching offers the best of both worlds. All good points, Vince. Would it be more efficient to maintain just the rules based approach though? After all, users generally develop custom rules based on frequency counts and statistics anyway. It would be pointless to have to update the probabilistic statistics at all, in my opinion. Some would even say that the important work is done before data gets to the matcher anyway, in the cleansing phase. A strong data standardization and cleansing solution leads to better matching, no matter what the approach. I'm asking the reader to consider if probabilistic is at all relevant for their situation. Disclaimer: The opinions expressed here are my own and don't necessarily reflect the opinion of my employer. The material written here is copyright (c) 2010 by Steve Sarsfield. To request permission to reuse, please e-mail me. 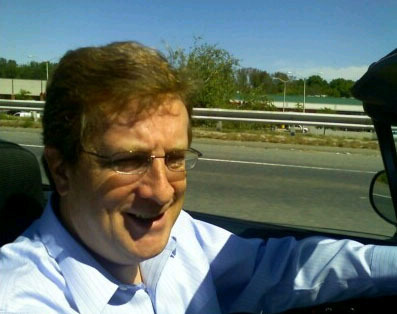 Data analytics evangelist and author of the book the Data Governance Imperative. Feel free to contact me at stevesarsfield@yahoo.com for topic suggestions.